The Savoie region has only been part of France since 1860! So it is difficult to imagine that Savoie was once a very powerful state, whose authority stretched from one side of the Alps to the other from the Middle Ages up to the 19th Century. After moving the region's capital in 1563 from Chambery to Turin, the House of Savoy gradually abandoned its ancestral home during the 18th Century. The King of Sardinia, Victor Amadeus III, joined forces with other kings opposing the French Revolution. Nevertheless, there was great jubilation throughout the region when the French General Montesquieu arrived in Chambery in 1792 to annexe Savoie. It became the 84th administrative department of France, home of Mont Blanc. However, this revolutionary interlude would only last about 20 years. The Treaty of Vienna, signed in 1815, marked its return to the Kingdom of Sardinia. During the first half of the 19th Century, Savoie's economy was very slow. The region's inhabitants found it harder and harder to accept the presence of tax collectors, civil servants and Piedmont soldiers. They were also concerned about supporters on the other side of the Alps, who wished to unite Savoie with Italy. Victor-Emmanuel II, like his father, and his Prime Minister, Cavour, dreamed of unifying Italy, a country still divided into states controlled byforeign sovereigns. Emperor Napoleon III signed a secret agreement in the town of Plombières in 1858 promising military support for the Piedmont area of Italy against the Austrian Empire. In return, Cavour would cede the County of Nice and the Duchy of Savoie to France. The war with Austria resumed in 1859. Following the victorious, yet deadly, battles of the Sardinian and French armies, such as that of Solferino, Napoleon III, conscious of French opinion and the attitude in Prussia, cast doubt once again on the annexation of Savoie. 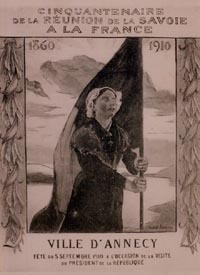 Subsequently, campaigns were organised throughout Savoie for and against joining France. Contrary to their views in 1848, the Conservatives - noblemen, clergymen and farmers - favoured the annexation, whereas the Liberals preferred either independence or even unification with Switzerland. The treaty annexing Nice and Savoie to France was signed in Turin on 24th March 1860. 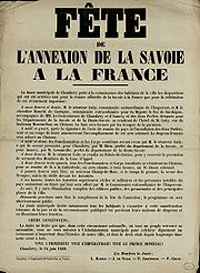 The treaty was followed on 22nd and 23rd April 1860 by a referendum in which the inhabitants of Savoie were offered the option of voting to approve or reject the annexation. It was at the Court of Appeal in Chambery that the results were officially announced to the question: "Does Savoie want to be joined with France? ". Only men could vote and out of the 135,449 registered voters, there were 71 invalid votes, 235 'No' votes and 130,533 'Yes' votes (141,893 including the results of servicemen enrolled on special electoral lists). 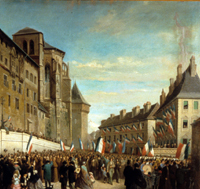 In August and September 1860, the two newly created administrative departments of Savoie and Haute-Savoie triumphantly welcomed their new sovereigns, Emperor Napoleon III and Empress Eugénie, during very prestigious celebrations throughout the province, particularly in Chambery and Annecy. So a curious outcome for Savoie, which was once a County, a Duchy and even a Kingdom. It has seen its capital moved from Chambery to Turin and was abandoned by its ancestral rulers, closely affiliated with others throughout Europe, to reign over an Italian peninsula, but now remains united.